Isabelle has been coming home from Kindergarten for the last couple of weeks schooling me on facts about the Pilgrims, Mayflower, and Native Americans. Clearly, they are in full blown Thanksgiving prep mode in school and never to be outdone I thought I would blow her mind today and take her to the "real" Mayflower (or a replica made in 1955 - details, details). Of course, knowing I had this great idea, Mother Nature decided to give us a huge cold blast this morning but that didn't stop us. 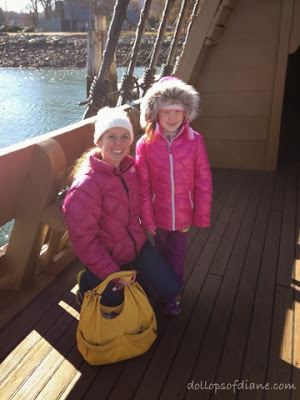 Plymouth, home of the Mayflower, Plymouth Rock, and other historic landmarks, is only about 45 minutes from our house so we bundled up and headed out for a girls' adventure. When we arrived at the waterfront it was so cold - like freeze your buns off cold. We headed for the Mayflower first and the windchill in the teens scared off most other people so we had the boat largley to ourselves. They had several "pilgrims" on the ship to answer our questions and tell us stories. After the Mayflower, we walked over and checked out Plymouth Rock. By then my face was stinging from the wind and I had tears pouring down my face so we walked to the car and drove to the Pilgrim Hall Museum which was a couple of blocks away. They had lots of cool artifacts, historical information, and a fun scavenger hunt that Isabelle loved to do. I actually learned quite a lot today. Although I knew the history basics and had been to Plymouth a bunch of times when I was younger, there were lots of new facts I picked up today that I didn't know or had forgotten. I think as an adult I also have a greater appreciation for the story and the struggles. I mean these people sailed on the boat for two months and then continued to live on the boat several more months while the colony was built in the WINTER. It was close quarters, bumpy, cold, dark, and wet. It's no wonder that half of the Pilgrims died before the first Thanksgiving. So my main takeaway from today is that I would have been one of the first Pilgrims to die. Did I mention how cold I was? There's no way I could have handled it. 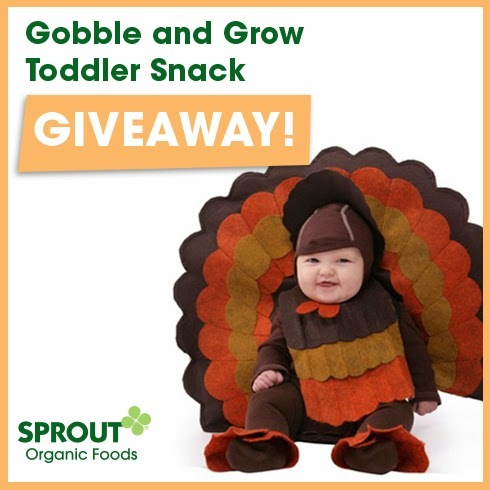 Sprout Organic Gobble and Grow Todder Snack Giveaway! Over the summer, my family had the opportunity to review Sprout's Organic Toddler Snacks and we gave them a thumbs up. You can check out the full review HERE. 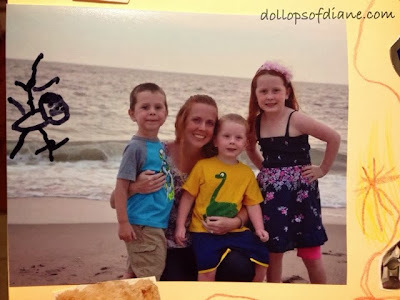 Well I'm excited to once again be partnering with Sprout Organic Foods for their Gobble and Grow Giveaway. What does this mean for you? You get the chance to win one of fifteen prize kits including Sprout Organic Toddler Snacks, both the Fruit & Veggie Crispy Chews and Fruity Yogurt Bites! Okay, okay, it's technically not winter yet but it sure feels like it today. I wanted to do something fun and outside with Daniel while the other two kids were at school so I thought we would get another use out of our membership and head to the Capron Zoo in Attleboro, MA. When we arrived the temperature was 28 degrees with a "feels like" 21 degrees taking into effect the windchill. When we got there and there wasn't another soul in sight I started to think maybe I had made a big mistake. It only took a few steps inside the zoo to realize I was actually, unknowingly, a genius. 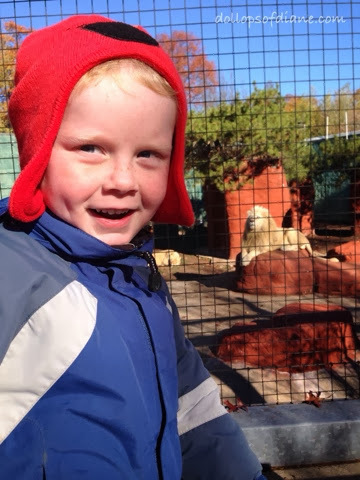 The zoo was GREAT. I had never seen the animals so active before. The animals in both the outside and inside exhibits were rocking. They were awake, running, bouncing, and strutting their stuff for us. Daniel could also run around like a mad man from exhibit to exhibit without being in anyone's way. It was awesome. So if you're looking for something to do, don't let the cold weather scare you aware from the zoo. We had a blast! I'm a sucker for a challenge. I just can't say no. So when I was recently asked to participate in a Game On! 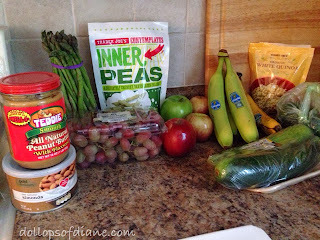 Diet challenge, I quickly looked over the rules and said yes. There is a book with all the rules but I'm participating in a Facebook group with one expert (Hi Susan!) who answers all my questions. Anyone who knows me knows that I'd have lots of questions since I'm a stickler for the rules. You are allowed one day off a week though where you can eat (and drink) whatever you want and one meal off a week, too. Those days are like godsends. So yeah...I started the challenge last Friday so today marks one week. It has definitely been a challenge and eye opening. For anyone who doesn't know me well, let me make this clear - I LOVE SUGAR. I am a eat brown sugar out of the bag kid of girl. Oh, and did I mention this challenge started the day after Halloween? Do you know how much trick or treat candy was in my house with three kids?! Basically, since you can't eat any sugar it really makes you eat food in its natural state - meats, nuts, fruit, veggies, etc. If you check the labels on just about anything else you will see some form of sugar in it. Also, some brands have sugar in their products while others don't. For example, the salsa we had in our fridge listed sugar as an ingredient. However, at the store I found another brand that didn't. Before this challenge I never would have even bothered to check for that. Conveniently, I had recently finished another crazy challenge where I couldn't eat any "bread" products so that helped prepare me for this challenge. I found that a lot of the gluten free products that I purchased do not have sugar in them so I am able to eat them. In general, I've found that the organic and more natural products do not have as much sugar in them. Of course, they are also more expensive though! The no alcohol thing has been manageable since I can still drink one day a week if I choose. The main thing that has been a killer for me is no Diet Pepsi. I drink Diet Pepsi each morning as if it were my coffee so the first few days were hard. All I could think about each morning was how I wanted a soda! It has been getting easier each morning though. I do miss having something else to drink besides water though. I drink a ton of water anyway each day so I always meet the requirement but I miss having something different to drink each day. I was so desperate the other day I even drank a flavored seltzer water (ick!). Soooo...anyway, that's my latest, crazy health kick that I've been working on. And I must say - it is working. I weighed in this morning and had lost 3 pounds in the last week. I really think the main reason I'm losing is because I can't snack on anything. I mean I guess I could eat celery but come on now, let's not be ridiculous. Yup, that's Henry, me, Daniel and Isabelle. Oh, wait..what's that? Well that's TIM, my husband, that Henry drew swimming in the background. Ha! 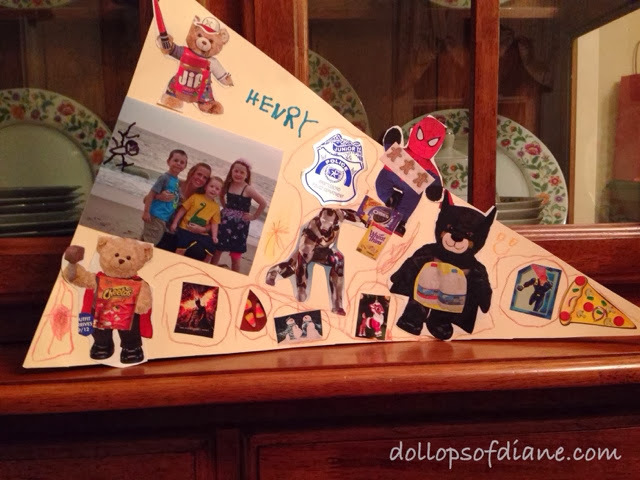 Please note that the superheroes are holding his favorite foods. Seriously, does it get any cuter? I think I want him to be four forever.